Thunderbirds is a British science-fiction television series created by Gerry and Sylvia Anderson, filmed by their production company AP Films (APF) and distributed by ITC Entertainment. It was produced between 1964 and 1966 using a form of electronic marionette puppetry (dubbed "Supermarionation") combined with scale model special effects sequences. Two series were filmed, comprising a total of thirty-two 50-minute episodes; production ceased following the completion of the second series' sixth episode when Lew Grade, the Andersons' financial backer, failed in his efforts to sell the programme to American network television. Set in the mid-2060s, Thunderbirds is a follow-up to the earlier Supermarionation productions Four Feather Falls, Supercar, Fireball XL5 and Stingray. It follows the exploits of International Rescue (IR), a life-saving organisation equipped with technologically-advanced land, sea, air and space rescue craft; these are headed by a fleet of five vehicles named the Thunderbirds and launched from IR's secret base in the Pacific Ocean. The main characters are ex-astronaut Jeff Tracy, the founder of IR, and his five adult sons, who pilot the Thunderbird machines. Thunderbirds began its first run in the United Kingdom on the ITV network in 1965 and has since been broadcast in at least 66 other countries. Periodically repeated, it was adapted for radio in the early 1990s and has influenced many TV programmes and other media. As well as inspiring various merchandising campaigns, the series has been followed by two feature-length film sequels (Thunderbirds Are Go and Thunderbird 6, released in 1966 and 1968 respectively), a 2004 live-action film adaptation and a mimed stage show tribute. The second of two TV remakes, the computer-animated Thunderbirds Are Go, premiered in 2015, in honour of the original show's 50th anniversary. Widely considered to be the Andersons' most popular and commercially successful series, Thunderbirds has received particular praise for its effects (directed by Derek Meddings) and musical score (composed by Barry Gray). It is also well remembered for its title sequence, which opens with an often-quoted countdown by actor Peter Dyneley (who voiced the character of Jeff): "5, 4, 3, 2, 1: Thunderbirds Are Go!" A real-life rescue service, the International Rescue Corps, is named after the organisation featured in the series. Thunderbird 1: a hypersonic rocket plane used for fast response and disaster zone reconnaissance. Piloted by Scott, IR's rescue co-ordinator. Thunderbird 2: a supersonic carrier aircraft that transports rescue vehicles and equipment in detachable capsules called "pods". Piloted by Virgil. Thunderbird 4: a utility submersible. Piloted by Gordon and usually launched from Thunderbird 2. Thunderbird 5: a space station that relays distress calls from around the world. Manned alternately by "space monitors" John and Alan. The family live on Tracy Island,[Note 2] IR's base in the South Pacific Ocean, in a luxurious villa that they share with Jeff's mother, engineer Brains, Brains' assistant Tin-Tin and Tin-Tin's father, Malaysian retainer Kyrano. In this remote location, IR is safe from spies and criminals who envy the organisation's technology and try to acquire the secrets of the Thunderbird machines. Some of IR's missions are prompted not by innocent misadventure, but sabotage or negligence. For missions requiring criminal investigation or intelligence-gathering, the organisation incorporates a network of undercover agents headed by English aristocrat Lady Penelope Creighton-Ward and her butler Aloysius Parker. Based at Creighton-Ward Mansion in Kent, Penelope and Parker travel in FAB 1, a specially-modified Rolls-Royce. IR's most persistent opponent is a master criminal known only as "The Hood". [Note 2] Operating from a temple in the Malaysian jungle, and possessing powers of hypnosis and dark magic, The Hood exerts telepathic control over Kyrano, his estranged half-brother, and manipulates the Tracys into rescue situations that unfold according to his own designs. This gives him opportunities to spy on the Thunderbird machines and, by selling their secrets, make himself rich. Thunderbirds was the fourth Supermarionation puppet TV series to be produced by APF, which was founded by the husband-and-wife duo of Gerry and Sylvia Anderson (née Thamm) with their business partners Arthur Provis, Reg Hill, and John Read. Pitched in late 1963, the series was commissioned by Lew Grade of ITC, APF's parent company, on the back of the positive audience response to Stingray. Gerry Anderson drew inspiration for the series' underlying concept from the West German mining disaster known as the Wunder von Lengede ("Miracle of Lengede"). In October 1963, the collapse of a nearby dam flooded an iron mine in the municipality of Lengede, killing 29 miners and trapping 21 others underground. Lacking the means to drill an escape shaft, the authorities were forced to requisition a heavy-duty bore from Bremen; despite the considerable time necessary to transport the bore by rail significantly reducing the chances of a successful rescue, 11 of the trapped miners were eventually saved. Recognising the advantages of swifter crisis response, Anderson conceived the idea of an "international rescue" organisation that could use supersonic aircraft to transport specialised rescue equipment quickly over long distances. Seeking to distinguish his 26-episode proposal from APF's earlier productions, Anderson attempted to pitch stories at a level that would appeal to both adults and children. Whereas previous series had been shown during the late afternoon, Anderson wanted Thunderbirds to be broadcast in a family-friendly primetime slot. Sylvia remembers that "our market had grown and a 'kidult' show ... was the next step." The Andersons retired to their holiday villa in Portugal to expand the premise, script the pilot episode and compose a scriptwriters' guide. According to Sylvia, the writing process depended on a "division of labour", whereby Gerry created the action sequences while she managed characterisation. The decision to make a father and his sons the main characters was influenced by the premise of Bonanza, as well as Sylvia's belief that the use of more than one heroic character would broaden the series' appeal. The Tracy brothers were named after Mercury Seven astronauts: Scott Carpenter, John Glenn, Virgil "Gus" Grissom, Gordon Cooper and Alan Shepard. The series' title was derived from a letter written by Gerry's brother, Lionel, while he had been serving overseas as an RAF flight sergeant during World War II. While stationed in Arizona, Lionel had made reference to Thunderbird Field, a nearby United States Army Air Forces base. Drawn to the "punchiness" of "Thunderbirds", Anderson dropped his working title of "International Rescue" and renamed both the series and IR's rescue vehicles, which had previously been designated Rescues 1 to 5. His inspiration for the launch sequences of Thunderbirds 1, 2 and 3 originated from contemporary United States Air Force launch procedure: Anderson had learnt how the Strategic Air Command would keep its pilots on permanent standby, seated in the cockpits of their aircraft and ready for take-off at a moment's notice. In the DVD documentary The Thunderbirds Companion, Anderson explained how a rise in filming costs had made overseas distribution revenue even more important and essentially caused Thunderbirds to be made "as an American show". During the character development and voice casting process, the Andersons' main priority was to ensure that the series had transatlantic appeal, thus increasing the chances of winning an American network deal and the higher audience figures that this market had to offer. Scripts were typed in American English and printed on US-style quarto-size paper. Thunderbirds was filmed at APF's studios on the Slough Trading Estate between 1964 and 1966. In preparation, the number of full-time crew was expanded to 100. Shooting began in September 1964 after five months of pre-production. Due to the new series' technical complexity, this was a period longer than for any of APF's earlier productions. To speed up the filming, episodes were shot in pairs, at a rate of one per month, on separate soundstages and by separate crews (designated "A" and "B"). By 1964, APF was the UK's largest commercial user of colour film, consuming more than three million feet (570 miles or 910 kilometres) of stock per year. Alan Pattillo, a longtime scriptwriter and director for APF, was appointed the company's first official script editor in late 1964. This move was aimed to reduce the burden on Gerry Anderson who, while reserving his producer's right to overall creative control, had grown weary of revising scripts himself. Direction of episodes was assigned in pairs: veterans Pattillo and David Elliott alternated with the less-experienced Desmond Saunders and newcomer David Lane for each month's filming. Due to the difficulties of setting up takes, progress was slow: even on a productive day, it was rare for the crew to complete more than two minutes of puppet footage. In a contemporary interview, Hill noted that Thunderbirds contained several times as many shots as a typical live-action series. He explained that rapid editing was necessary on account of the characters' lack of facial expression, which made it difficult to sustain the viewer's interest for more than a few seconds per shot. Lew watched ["Trapped in the Sky"] and at the end he jumped up shouting, 'Fantastic, absolutely fantastic! This isn't a television series – this is a feature film! You've got to make this as an hour!' ... I'm glad we did it, because it made the series much bigger and much more important. But it was still a very, very difficult job. After viewing the completed 25-minute pilot, "Trapped in the Sky", Lew Grade was so impressed by APF's work that he instructed Anderson to double the episode length and increased the series' budget per episode from £25,000 to £38,000. As a result, Thunderbirds became not only the company's longest and highest-budgeted production, but also among the most expensive TV series to have been made up to that point. The crew, who had been filming at a rate of two 25-minute episodes per fortnight, faced significant challenges during the transition to the new format: eight episodes had already been completed, scripts for up to ten more had been written, and substantial rewrites would be necessary to satisfy the longer running time. Anderson lamented: "Our time-scale was far too drawn out. ITC's New York office insisted that they should have one show a fortnight ... Everything had to move at twice the speed." APF spent over seven months extending the existing episodes. Tony Barwick, who had impressed Pattillo and the Andersons with an unsubmitted script that he had written for Danger Man, was recruited to assist in the writing of subplots and filler material. He found that the longer format created opportunities to strengthen the characterisation. Science-fiction writer John Peel suggests that "small character touches" make the puppet cast of Thunderbirds "much more rounded" than those of earlier APF series. He compares the writing favourably to that of live-action drama. The new footage proved useful during the development of the first series finale, "Security Hazard": since the previous two episodes ("Attack of the Alligators!" and "The Cham-Cham") had overspent their budgets, Pattillo devised a flashback-dominated clip show containing only 17 minutes of new material to reduce costs. Filming of Series One was completed in December 1965. A second series was also commissioned late that year and entered production in March 1966. Barwick became a full-time member of the writing staff and took over the role of script editor from the outgoing Pattillo. The main puppet cast and vehicles were rebuilt; in addition, the art department expanded some of the standing sets, including the Tracy Villa lounge and the Thunderbird 5 control room. To accommodate the simultaneous filming of the TV series and Thunderbirds Are Go, APF purchased two more buildings on the Slough Trading Estate and converted them into new stages. As crew and studio space were divided between the two productions, filming of the TV series progressed at half the previous speed, as APF's B crew produced one episode per month. Filming on Thunderbirds Are Go was completed by June, allowing A crew to resume work on the series to shoot what would prove to be its penultimate episode, "Ricochet". Production of Thunderbirds ended in August 1966 with the completion of the sixth episode of Series Two. In February that year, it had been reported that Grade had been unable to sell the series in the United States due to disagreements over timeslots. In July, he cancelled Thunderbirds after failing in his second attempt to secure an American buyer. The three major US networks of the time – NBC, CBS and ABC – had all bid for the series, with Grade repeatedly increasing the price. When NBC withdrew its offer, the other two immediately followed. By the time of its cancellation, Thunderbirds had become widely popular in the UK and was being distributed extensively overseas. Grade, however, believed that without the financial boost of an American network sale, a full second series would fail to recover its production costs. He therefore asked Anderson to devise a new concept that he hoped would stand a greater chance of winning over the profitable US market. This became Captain Scarlet and the Mysterons. Tin-Tin Kyrano Maintenance technician, laboratory assistant. Voice-recording sessions were supervised by Pattillo and the Andersons, with Sylvia Anderson in charge of casting. Dialogue was recorded once per month at a rate of two scripts per session. Supporting parts were not pre-assigned, but negotiated by the cast among themselves. Two recordings would be made at each session: one to be converted into electronic pulses for the puppet filming, the other to be added to the soundtrack during post-production. The tapes were edited at Gate Recording Theatre in Birmingham. In the interest of transatlantic appeal, it was decided that the main characters would be mostly American and therefore actors capable of producing an appropriate accent were used. British, Canadian and Australian actors formed most of the voice cast; the only American involved was stage actor David Holliday, who was noticed in London's West End and given the part of Virgil Tracy. Following the completion of the first series, Holliday returned to the US. The character was voiced by English-Canadian actor Jeremy Wilkin for Thunderbirds Are Go, Series Two and Thunderbird 6. British actor David Graham was among the first to be cast. He had previously voiced characters in Four Feather Falls, Supercar, Fireball XL5 and Stingray. Beyond the APF productions, he had supplied one of the original Dalek voices on Doctor Who. Cast alongside Graham was Australian actor Ray Barrett. Like Graham, he had worked for the Andersons before, having voiced Titan and Commander Shore in Stingray. A veteran of radio drama, Barrett was skilled at performing a range of voices and accents in quick succession. Villains of the week would typically be voiced by either Barrett or Graham. Aware of the sensitive political climate of the Cold War and not wishing to "perpetuate the idea that Russia was the enemy with a whole generation of children watching", Gerry Anderson decided the Hood (voiced by Barrett) should be Oriental and placed his temple hideout in Malaysia to defy the viewer's expectations. Although Lady Penelope and Parker (the latter voiced by Graham) were among the first characters developed, neither was conceived as a major role. Parker's Cockney manner was based on a waiter at a pub in Cookham that was sometimes visited by the crew. On Gerry Anderson's recommendation, Graham dined there regularly to study the accent. Anderson's first choice for the role of Penelope had been Fenella Fielding, but Sylvia insisted she take the part herself. Her Penelope voice was intended to emulate Fielding and Joan Greenwood. On Penelope and Parker's secondary role as comic relief, Gerry explained, "We British can laugh at ourselves, so therefore we had Penelope and Parker as this comedy team. And in America they love the British aristocracy too.'" As well as Jeff Tracy, English-Canadian actor Peter Dyneley voiced the recurring character of Commander Norman, chief of air traffic control at London International Airport. His supporting character voices were typically those of upper-class Englishmen. Shane Rimmer, the voice of Scott, was cast on the strength of his performance on the BBC soap opera Compact. Meanwhile, fellow Canadian Matt Zimmerman was selected at a late stage in the process. The expatriate West End actor was given the role of Alan on the recommendation of his friend, Holliday: "They were having great difficulty casting the part of Alan as they wanted a certain sound for him, being the youngest brother. David, who [was] a bit older than I am, told them that he had this friend, me, who would be great." Christine Finn, known for her role in the TV serial Quatermass and the Pit, provided the voices of Tin-Tin Kyrano and Grandma Tracy. With Sylvia Anderson, she was also responsible for voicing most of the female and child supporting characters. Supporting parts were occasionally voiced by John Tate (the father of Space: 1999 actor Nick Tate), Paul Maxwell and Charles Tingwell; the latter two joined the cast in Series Two following their contributions to Thunderbirds Are Go. None of these three actors were credited for their performances. The puppet stages used for the filming of Thunderbirds were only one-fifth the size of those used for a standard live-action production, typically measuring 12 by 14 by 3 metres (39.4 by 45.9 by 9.8 ft) in length, width and height. Bob Bell, assisted by Keith Wilson and Grenville Nott, headed the art department for Series One. During the simultaneous filming of Series Two and Thunderbirds Are Go in 1966, Bell attended mainly to the film, entrusting set design for the TV series to Wilson. Since it was necessary for the art department's interior sets to conform to the effects department's exterior plans, each team closely monitored the other's work. According to Sylvia Anderson, Bell's challenge was to produce complex interiors on a limited budget while resisting the effects department's push for "more extravagant" design. This task was complicated by the unnatural proportions of the puppets: Bell struggled to decide whether the sets should be built to a scale proportionate to their bodies or their oversized heads and hands. He used the example of FAB 1 to illustrate the problem: "As soon as we positioned [the puppets] standing alongside [the model], they looked ridiculous, as the car towered over them." He ultimately adopted a "mix-and-match" approach, in which smaller items, such as tableware, were scaled to their hands and furniture to their bodies. While designing the Creighton-Ward Mansion sets, Bell and his staff strove for authenticity, ordering miniature Tudor paintings, ​1⁄3-scale Georgian- and Regency-style furniture and carpeting in the shape of a polar bear skin. This realism was enhanced by adding scrap items acquired from household waste and electronics shops. For example, a vacuum cleaner pipe serves as Virgil Tracy's launch chute. The head puppet sculptor was Christine Glanville, who also served as the lead puppeteer. Glanville's four-person team built the 13 members of the main cast in six months at a cost of between £250 and £300 per puppet (approximately £5,000 and £6,000 in 2018). Since pairs of episodes were being filmed simultaneously on separate stages, the characters needed to be sculpted in duplicate. Facial expressions were diversified by means of replaceable heads: as well as a head with a neutral expression, each main character was given a "smiler", a "frowner" and a "blinker". The finished puppets were approximately 22 inches (56 cm) tall, or ​1⁄3 adult human height. The puppets were made up of more than 30 individual components, the most important of which was the solenoid that synchronised lip movements with the characters' pre-recorded dialogue. This device was positioned inside the head unit; consequently, torsos and limbs appeared relatively small. The puppets' likenesses and mechanics are remembered favourably by puppeteer Wanda Brown, who preferred the Thunderbirds marionettes over the accurately-proportioned ones that first appeared in Captain Scarlet: "The puppets were easier to operate and more enjoyable because they had more character to them ... Even some of the more normal-looking faces, such as Scott and Jeff, for me had more character than the puppets in the series that came afterwards." Rimmer speaks positively of the puppets' still being "very much caricatures", since it made them "more lovable and appealing ... There was a naive quality about them and nothing too complex." The appearances of the main characters were inspired by those of actors and other entertainers, who were typically selected from the show business directory Spotlight. According to Glanville, as part of a trend away from the strong caricature of previous series, APF was seeking "more natural faces" for the puppets. The face of Jeff Tracy was based on that of Lorne Greene, Scott on Sean Connery, Alan on Robert Reed, John on Adam Faith and Charlton Heston, Brains on Anthony Perkins and Parker on Ben Warriss. Sylvia Anderson brought the character of Penelope to life in likeness as well as voice: after her test moulds were rejected, sculptor Mary Turner decided to use Anderson herself as a template. Main character heads were initially sculpted in either Plasticine or clay. Once the general aspect had been finalised, this served as the template for a silicone rubber mould. This was coated with Bondaglass (fibreglass mixed with resin) and enhanced with Bondapaste, a putty-like substance, to accentuate contours. The Bondaglass shell was then fitted with a solenoid, leather mouth parts and plastic eyes, as well as incisor teeth – a first for a Supermarionation production. Puppets known as "revamps", which had plastic heads, portrayed the supporting characters. These marionettes started their working lives with only a mouth and eyes; their faces were remoulded from one episode to the next. Particularly striking revamp moulds were retained and, as their numbers increased, photographed to compile an internal casting directory. Wigs were made of mohair or, in the case of the Penelope puppet, human hair. Puppet bodies were built in three sizes: "large male" (specifically for the Tracys and the Hood), "small male" and "small female". Sylvia Anderson, the head costume designer, devised the main characters' attire. To give the puppets increased mobility, the costume department generally avoided stiff synthetic materials, instead working with cotton, silk and wool. Between 1964 and 1966, the department's stock numbered more than 700 costumes. Each puppet's head was fitted with about 10 thin tungsten steel wires. During the filming, dialogue was played into the studio using modified tape recorders that converted the feed into electronic pulses. Two of the wires relayed these pulses to the internal solenoid, completing the Supermarionation process. The wires, which were sprayed black to reduce their visibility, were made even less noticeable through the application of powder paint that matched the background colours of the set. Glanville explained the time-consuming nature of this process: "[The puppeteers] used to spend over half an hour on each shot getting rid of these wires, looking through the camera, puffing a bit more [paint] here, anti-flare there; and, I mean, it's very depressing when somebody will say to us, 'Of course the wires showed.'" Positioned on an overhead gantry with a hand-held cruciform, the puppeteers co-ordinated movements with the help of a viewfinder-powered CCTV feedback system. As filming progressed, the crew started to dispense with wires and instead manipulate the puppets from the studio floor using rods. Since we always tried to minimise walking, we'd show the puppets taking one step only, then promptly cut. Through interspersing the programmes with "meanwhile" scenes – that is, showing what else was going on in the story at the same time – we would then cut back to the puppet who was now already in his craft. Due to their low weight and the fact that they had only one control wire per leg, the puppets were unable to walk convincingly. Therefore, scenes involving movement were filmed from the waist up, with a puppeteer holding the legs below the level of the camera and using a "bobbing" action to simulate motion. Alternatively, dynamic shots were eliminated altogether: in an interview with New Scientist, director of photography John Read spoke of the advantages of circumventing the lack of agility so that the puppets "appear, for example, to walk through doors (although the control wires make this impossible) or pick up a coffee cup (although their fingers are not in fact jointed)." Live-action shots of human hands were inserted whenever scripts called for more dexterous actions to be performed. The effects for all the APF series from Supercar to UFO were directed by Derek Meddings, who later worked on the James Bond and Superman films. Knowing that Thunderbirds would be the "biggest project [APF] had worked on", Meddings found himself struggling to manage his workload with the single filming unit that had produced all the effects for Stingray. He therefore established a second unit under technician Brian Johncock, and a third exclusively for filming airborne sequences. This expansion increased the number of APF crews and stages to five each. A typical episode contained around 100 effects shots; Meddings' team completed up to 18 per day. An addition to the effects department was Mike Trim, who served as Meddings' assistant in designing vehicles and buildings. Meddings and Trim jointly pioneered an "organic" design technique in which the exteriors of models and sets were customised with parts from model kits and children's toys. Models and sets were also "dirtied down" with powder paint or pencil lead to create a used look. Toy cars and vans were used in long shot, while scale vehicles were equipped with basic steering and suspension for added realism. Miniature fans and Jetex pellets, which are capable of issuing air jets or chemical exhaust, were attached to the undersides to simulate dust trails. Another of Meddings' inventions was a closed, cyclical effects stage nicknamed the "rolling road": consisting of two or more loops of canvas running at different speeds, this device allowed shots of moving vehicles to be filmed on a static set to make more efficient use of the limited studio space. Airborne aircraft sequences were mounted against a "rolling sky", with smoke fanned across to simulate passing clouds. Stourhead House, an 18th-century Palladian building, inspired the look of Creighton-Ward Mansion. One of Meddings' first tasks was to shoot stock footage of the Thunderbird machines and the series' main locations, Tracy Island and Creighton-Ward Mansion. The finished island model was a composite of more than a dozen smaller sets that could be detached from the whole and filmed separately. The architecture of the mansion was based on that of Stourhead House, located on the Stourhead Estate in Wiltshire. In the absence of head designer Reg Hill, who was serving as associate producer, Meddings was further tasked with designing the Thunderbird fleet and FAB 1. Scale models for the six main vehicles were built by a contractor, Master Models of Middlesex. Models and puppet sets combined, more than 200 versions of the Thunderbird machines were created for the series. During the designing and filming process, Meddings' first priorities were realism and credibility. With the exception of Thunderbird 5, each vehicle was built in three or four scales. Meddings' swing-wing concept for Thunderbird 1 was inspired by his wish to create something "more dynamic" than a fixed-wing aircraft. He remained unsatisfied with the prototype of Thunderbird 2 until he inverted the wings, later commenting, "... at the time, all aircraft had swept-back wings. I only did it to be different." This decision was made out of personal preference and was not informed by any expert knowledge on Meddings' part. He described the Thunderbird 2 launch as "probably the most memorable" sequence that his team devised for an APF production. The largest model of Thunderbird 3, whose design was loosely based on the Soviet Soyuz rocket, was six feet (1.8 m) tall. Thunderbird 4 was particularly difficult to film: as the scale of the model did not correspond to the water inside the shooting tank, creative camera angles and rapid editing were used to produce a sense of realistic perspective. Thunderbird 5, the most difficult vehicle for Meddings to visualise, was based on the Tracy Island Round House. Since most of the space station's appearances were provided by stock footage, the model was rarely filmed. Pod Vehicles were designed on an episode-by-episode basis and built from balsa wood, Jelutong wood or fibreglass. To save time and costs, other minor vehicles were built in-house from radio-controlled model kits. As the puppets of Lady Penelope and Parker needed to fit inside, the largest of all the models was the seven-foot FAB 1, which cost £2,500 (approximately £50,000 in 2018) to build. The Rolls-Royce's name and colour were both chosen by Sylvia Anderson. Rolls-Royce Ltd. supervised the construction of the plywood model and supplied APF with an authentic radiator grille for close-up shots of the front of the car. In exchange for its cooperation, the company requested that a Spirit of Ecstasy be fixed to the chassis and that the characters avoid referring to the brand with abbreviations such as "Rolls". Some of the aircraft sound effects were created by recording the RAF's Red Arrows aerobatics display team in flight. Scale explosions were created using substances such as fuller's earth, petrol gel, magnesium strips and Cordtex explosive. They were originally filmed at up to 120 frames per second (f.p.s. ), so that when slowed down to the regular 24 f.p.s., their apparent magnitude and length would be increased. Gunpowder canisters were ignited to create rocket jets. The wires that electronically fired the rockets also allowed a member of the crew, holding a cruciform and positioned on an overhead gantry, to "fly" the model over the set. By far the most unwieldy model was Thunderbird 2, which Meddings remembered as being "awful" to fly. A combination of unreliable rockets and weak wiring frequently caused problems: should the former be slow to ignite, the current quickly caused the latter to overheat and snap, potentially damaging the model and even setting fire to the set. Conditions above the studio floor were often dangerous due to the heat and smoke. Although many of the exhaust sound effects used in the series were drawn from an audio library, some were specially recorded during a Red Arrows display at RAF Little Rissington in Gloucestershire. By 1966, Meddings' commitments were split between Series Two and Thunderbirds Are Go. While Meddings worked on the film, camera operator Jimmy Elliott assumed the responsibility of directing the TV effects. By this stage, the basic frame of Thunderbird 2 had been damaged so many times that the model had needed to be rebuilt from scratch. Meddings was displeased with the result, reflecting that the replacement was "not only the wrong colour, it was a completely different shape ... I never felt our model-makers managed to recapture the look of the original." Critic David Garland suggests that the challenge facing the Thunderbirds effects department was to strike a balance between the "conventional science-fiction imperative of the 'futuristic'" and the "seeping hyper-realist concerns mandated by the Andersons' approach to the puppets". Thunderbirds has been praised for the quality of its effects. Jim Sangster and Paul Condon, writers of Collins Telly Guide, consider the model work "uniformly impressive". To Paul Cornell, Martin Day and Keith Topping, writers of The Guinness Book of Classic British TV, the effects are "way beyond anything seen on TV previously". Impressed by their work on Thunderbirds, film director Stanley Kubrick hired several members of Meddings' staff to supervise the effects shooting for 2001: A Space Odyssey. The series' title sequence, storyboarded by Gerry Anderson, is made up of two parts. It opens with a countdown of "5, 4, 3, 2, 1: Thunderbirds Are Go! ", provided by Dyneley in character as Jeff Tracy. In a departure from the style of Stingray, the Thunderbirds title sequence varies with each episode: the first part consists of an action montage that serves as a preview of the plot. Simon Archer and Marcus Hearn, biographers of Gerry Anderson, compare this device favourably to a film trailer. The second part, accompanied by composer Barry Gray's "The Thunderbirds March", features portraits of the main puppet cast superimposed on various vehicles and settings. Peel describes this as "ostensibly a return to the 'series stars' concept long known in TV", while Garland considers such imagery demonstrative of Anderson's commitment to "incremental realism" through a convergence of human and puppet characteristics. Essayist Jonathan Bignell suggests that the use of portraits conveys Anderson's partiality to "visual revelation of machines and physical action". According to Daniel O'Brien, writer of SF:UK: How British Science Fiction Changed the World, the Thunderbirds title sequence encapsulates the reasons for the series' enduring popularity. Dyneley's countdown is particularly well remembered and has been widely quoted. Dean Newman of the Syfy channel website ranks Thunderbirds eighth in a list of "Top 10 TV title sequences", while Den of Geek's Martin Anderson considers the sequence the best of any TV series. The score was composed by Gray, who served as musical director for all of the Anderson productions up to the first series of Space: 1999. In response to Gerry Anderson's request that the main theme have a "military feel", Gray produced a brass-dominated piece titled "The Thunderbirds March", which was recorded in December 1964 at Olympic Studios in London. The end titles were originally to have been accompanied by "Flying High", a lyrical track sung by Gary Miller with backing by Ken Barrie. Ultimately, a variation of the march was used instead. Incidental music was recorded over nine months between March and December 1965. As most of the music budget was spent on the series' earlier episodes, later instalments drew heavily on APF's ever-expanding music library. Peel considers "The Thunderbirds March" to be "one of the best TV themes ever written – perfect for the show and catchy when heard alone". Morag Reavley of BBC Online argues that the piece is "up there ... in the quintessential soundtrack of the Sixties" with the James Bond films and the songs of Frank Sinatra, Elvis and The Beatles. More generally, he praises the series' "catchy, pulse-quickening tunes", as well as Gray's aptitude for "musical nuance" and the mixing of genres. Heather Phares of Allmusic considers "Thunderbirds Are Go!" – the track accompanying the launch sequences of Thunderbirds 1, 2 and 3 – to be a reflection of the mod aspect of 1960s British spy fiction. She also highlights Gray's homage to – and divergence from – musical norms, commenting that his score "sends up the spy and action/adventure conventions of the '60s very stylishly and subtly". David Huckvale identifies Wagnerian homage in both the theme music and the series' premise. Noting that the theme's opening string ostinato is similar in effect to a recurring motif in Ride of the Valkyries, he also likens the Thunderbird machines to Valkyries themselves: "Their function is more benevolent than those warrior maidens, but they do hover over danger, death and destruction." Kevin J. Donnelly of the University of Southampton acknowledges the series' "big-sounding orchestral score", which he compares to that of a live-action film. He also suggests that the music serves partly to draw attention away from the physical imperfections of the puppets. Granada transmitted Thunderbirds in its original, 50-minute format for the first time with the start of repeats in 1966. In 1968, the franchise briefly aired episodes in three parts due to timeslot restrictions. The availability of repeats during the 1960s and 1970s varied among regions. ATV Midlands screened the series regularly into the early 1970s; by contrast, Thunderbirds was entirely absent from Yorkshire Television between 1968 and 1976. The series was last transmitted on the ITV franchises in 1981. In 1990, 8 of the 19 audio episodes released by APF Records were converted into radio dramas, which were transmitted on BBC Radio 5. The success of the radio series encouraged the BBC to acquire the rights to the TV episodes, which it broadcast simultaneously in all regions from September 1991 on BBC2. Since the end of the first network run, which achieved average viewing figures of more than six million, the BBC has repeated the series six times: between 1992 and 1993 (Series One only), 1994 and 1995 (nine episodes only), and 2000 and 2001 (in remastered form), as well as in 2003, 2005 and 2006. Other channels that have shown repeats include UK Gold (1994–95), Bravo (1996–97), Cartoon Network (2001–02), Boomerang (2001–03) and Syfy (2009). In Scotland, the BBC screened a Gaelic dub, Tairnearan Tar As ("Thunderbirds Are Go") in the early 1990s. Before its UK debut, Thunderbirds was distributed to 30 other countries including the US, Canada, Australia and Japan. Pre-sales revenue totalled £350,000 (approximately £7 million today). In the year following the series' first appearance, the number of countries increased to 66. In Japan, where it was first broadcast by NHK, Thunderbirds attracted a sizeable fan following and influenced series such as Ultraman, Mighty Jack, Himitsu Sentai Gorenger, Super Rescue Solbrain and Neon Genesis Evangelion. In the US, the 25-minute format entered first-run syndication, to modest success, in 1968. Other overseas broadcasters have included TechTV and Family Room HD (US), BBC Kids and YTV (Canada), Nine Network and Foxtel (Australia), TVNZ (in the 1980s) and later TV3 (New Zealand), MediaCorp TV12 Kids Central (Singapore) and RTÉ Two (Republic of Ireland). Thunderbirds is generally considered the Andersons' most popular series and their greatest critical and commercial success. In 1966, the show received a Royal Television Society Silver Medal for Outstanding Artistic Achievement and Gerry Anderson received an honorary fellowship of the British Kinematograph, Sound and Television Society. In 2007, Thunderbirds achieved 19th place in a Radio Times magazine reader poll to determine the best science-fiction TV programme of all time. It is ranked fourth by the 2013 Channel 5 list show 50 Greatest Kids' TV Shows. For Peel, Thunderbirds is "without a doubt the peak of the Supermarionation achievement". Suggesting that the series is pitched at a "more adult" level than its predecessors, he adds that its sense of adventure, effective humour and "gripping and convincing" episodes ensured that "everyone in the audience found something to love about it." Simon Heffer, a fan of Thunderbirds in childhood, commented positively on the series for The Daily Telegraph in 2011: "All the elements we children discerned in whatever grown-up television we had been allowed to watch were present in Thunderbirds: dramatic theme and incidental music; well-developed plots; goodies and baddies; swaggering Americans, at a time when the whole of Britain was in a cultural cringe to them; and, of course, glamorous locations ... Then, of course, there was the nail-biting tension of the rescues themselves ..." Film critic Kim Newman describes the series as a "television perennial". In his foreword to John Marriott's book, Thunderbirds Are Go!, Anderson put forward several explanations for the series' enduring popularity: it "contains elements that appeal to most children – danger, jeopardy and destruction. But because International Rescue's mission is to save life, there is no gratuitous violence." According to Anderson, Thunderbirds incorporates a "strong family atmosphere, where Dad reigns supreme". Both O'Brien and script editor Alan Pattillo have praised the series' positive "family values". In addition, Heffer and others have written of its cross-generational appeal. In 2000, shortly before the series' BBC revival, Brian Viner remarked in Radio Times that Thunderbirds was on the point of "captivating yet another generation of viewers". Stuart Hood, writing for The Spectator in 1965, praised Thunderbirds as a "modern fairy tale"; adding that it "can sometimes be frightening", he recommended that children watch it accompanied by their parents. Writing for Dreamwatch in 1994, Andrew Thomas described Thunderbirds as only "nominally" a children's programme: "Its themes are universal and speak as much to the adult in the child as the child in the adult." Jeff Evans, author of The Penguin TV Companion, argues that the series' 50-minute format allows for stronger character development and "tension-building". O'Brien is less positive in his appraisal of the writing, asserting that the plots are often "formulaic" and are sometimes "stretched to snapping point" by the extended running time. Cornell, Day and Topping are critical: they consider the writing at times "woefully poor" and argue that Thunderbirds as a whole is "often as clichéd as previous Anderson series". Peel, despite praising the storylines and characterisation, suggests that the "tongue-in-cheek" humour of Stingray is less evident. Where Thunderbirds improves on its predecessor, Peel believes, is in its rejection of fantasy plot devices, child and animal characters, comical and stereotyped villains and what he terms the "standard Anderson sexism": female characters, marginalised in earlier series, are more commonly seen to play active and sometimes heroic roles. Noting the attention to detail of the series' launch sequences, Jonathan Bignell argues that part of the motivation for dedicating large amounts of screen time to the Thunderbird craft is the need to compensate for the limited mobility of the puppet cast. The focus on futuristic machines has also been explored by cultural historian Nicholas J. Cull, who comments that of all the Andersons' series, Thunderbirds is the most evocative of a recurring theme: the "necessity of the human component of the machine", whereby the failures of new technology are overcome by "brave human beings and technology working together". This makes the series' vision of the 2060s "wonderfully humanistic and reassuring". O'Brien similarly praises this optimism, comparing the Tracy family to guardian Übermensch. Writing for Wired UK magazine, Warren Ellis asserts that the series' scientific vision could inspire the next generation of "mad and frightening engineers", adding that Thunderbirds "trades in vast, demented concepts ... immense and very beautiful ideas as solutions to problems." Thomas argues that the world of Thunderbirds is similar to the 1960s to the extent that contemporary capitalism and class structures appear to have survived mostly intact. He also observes, however, that wealth and high social status are often depicted as character flaws rather than strengths. According to Thomas, a contributing factor to the series' lasting popularity is the realism of IR's machines. Newman, for his part, suggests that "the point isn't realism. The 21st century of Thunderbirds is detailed ... but also de-populated, a high-tech toyland". He is more negative in his comparisons of contemporary and future values, noting the "square, almost 50s" attitudes to race, gender and class. With regard to stereotyping, Hood comments that he "would be happier if [villains] didn't seem to be recognisable by their pigmentation". Cull, by contrast, considers the series largely progressive on the subject of race, arguing that it rejects negative stereotyping through the use of "positive non-white characters" such as Kyrano and Tin-Tin. However, he deems many of the one-off villains derivative, commenting that these characters are typically presented as "corrupt businessmen, spivs and gangsters familiar from crime films". Various commentators – including Bignell, Cull and O'Brien – have also discussed Thunderbirds as a product of the Cold War era. Bignell comments that the Hood's Oriental appearance and mysterious powers draw parallels with James Bond villains and fears of China operating as "a 'third force' antagonistic to the West". Cull observes that, despite the series' focus on the dangers of nuclear technology, the Thunderbird machines contradict this particular theme: in their case, "an image of technology associated with the threat of Cold War mass destruction – the rocket emerging from the hidden silo – was appropriated and deployed to save life rather than to take it." He argues that the series adheres more closely to cultural norms by drawing on the "Cold War cult of the secret agent whose skills defend the home from enemies unknown", noting Lady Penelope's role as a spy in addition to two episodes ("30 Minutes After Noon" and "The Man from MI.5") that are heavily influenced by the James Bond novels and film adaptations. During a 2001 exhibition dedicated to the series, Masaaki Hirakata, curator at the Tokyo Metropolitan Museum of Photography, likened Thunderbirds to "a modern sci-fi expression of bunraku, which probably explains why it was accepted so readily [in Japan]". The series' presentation of smoking was the subject of a study published in the medical journal Tobacco Control in 2002. Despite identifying examples in 26 episodes, Kate Hunt of the University of Glasgow concluded that Thunderbirds does not actively promote smoking – a view opposed by the Roy Castle Lung Cancer Foundation (RCLCF) at the time of the series' relaunch on BBC 2. Rejecting the RCLCF's proposal that the remastered episodes be edited to digitally erase all visible cigarettes and cigars, the BBC stated that the series "does not glorify or encourage smoking" and described the activity as "incidental to the plot". More than 3,000 Thunderbirds-themed products have been marketed since the series' debut. To accommodate the high demand for tie-ins, APF established three dedicated subsidiaries: AP Films Merchandising, AP Films Music and AP Films Toys. Some British commentators dubbed the 1966 end-of-year shopping season "Thunderbirds Christmas" due to the series' popularity. In the early 1990s, Matchbox launched a new toy range to coincide with the BBC 2 repeats. Sales figures for Christmas 1992 exceeded those achieved by the Star Wars merchandising campaigns of the 1970s and 1980s. Demand for Matchbox's Tracy Island Playset overwhelmed supply, resulting in shop fights and a substantial black market for the toy. A comic strip featuring the characters of Lady Penelope and Parker debuted in the early issues of APF Publishing's children's title TV Century 21 in 1965. A full-length Thunderbirds strip appeared a year later, at which point the Lady Penelope adventures were given their own comic. Thunderbirds, Lady Penelope and Captain Scarlet and Thunderbirds annuals were published in the late 1960s; during the same period, eight original novels were written. In 2008, FTL Publications of Minnesota launched a new series of tie-in novels. Between 1965 and 1967, APF Records released 19 audio episodes in the form of vinyl EPs. Three are original stories; the rest are adapted from TV episode soundtracks, with additional narration provided by a member of the voice cast. The series' first video game tie-in, developed for the Commodore 64 and ZX Spectrum computers, was released by Firebird Software in 1985. Other titles have since been released for the Game Boy Color, Game Boy Advance and PlayStation 2. During the late 1980s, the series was issued on home video for the first time by PolyGram and its subsidiary Channel 5. Following its acquisition by Carlton International Media in 1999, Thunderbirds was digitally remastered for the release of the first DVD versions in 2000. Blu-ray Disc editions followed in 2008. Thunderbirds has been followed by two film sequels, a live-action film adaptation, two animated TV remakes and several re-edited presentations for TV broadcast and home video. The second of the remakes, Thunderbirds Are Go, premiered on ITV in 2015, the 50th anniversary year of the original. The feature-length film sequels Thunderbirds Are Go and Thunderbird 6 were released in 1966 and 1968. The first was greenlit by Lew Grade before the TV series had started its broadcast run. Written and produced by the Andersons and directed by David Lane, both films were distributed by United Artists. Neither was a critical or commercial success, and Century 21 Cinema's plans for further sequels were abandoned. In the early 1980s, episodes of Thunderbirds and other Supermarionation series were re-edited by ITC's New York offices to create a series of compilation films. Branded "Super Space Theater", this format was mostly intended for family viewing on American cable and syndicated TV. Three Thunderbirds features were produced: Thunderbirds to the Rescue, Thunderbirds in Outer Space and Countdown to Disaster. Plans for a live-action film adaptation were first announced in 1993. These eventually culminated in the 2004 film Thunderbirds, directed by Jonathan Frakes and produced by StudioCanal and Working Title Films. It was a critical and commercial failure and was poorly received by fans of the TV series. The Andersons sold their intellectual and profit participation rights to Thunderbirds and their other productions in the 1970s. As a result, they had no developmental control over subsequent adaptations of their works. Thunderbirds was first remade for TV in the early 1980s as Thunderbirds 2086. In this anime re-imagining, set 20 years after the original, the vastly expanded IR is based within an arcology and operates 17 Thunderbird machines. It was inspired by Thunderhawks, an updated story concept by Gerry Anderson and Reg Hill that later served as the basis for Anderson's Supermacromation series Terrahawks. Two re-edited series, based on condensed versions of 13 of the original episodes, aired in the US in 1994. The first, Thunderbirds USA, was broadcast as part of the Fox Kids programming block; the second, Turbocharged Thunderbirds, was syndicated by UPN. Developed as a comedy, Turbocharged Thunderbirds moved the action to the planet "Thunder-World" and combined the original puppet footage with new live-action scenes featuring a pair of human teenagers. As well as Thunderhawks, Anderson developed other ideas for a remake. A 1976 concept, Inter-Galactic Rescue 4, was to have featured a variable-configuration craft capable of performing rescues on land and sea, in air and in space; Anderson pitched the idea to NBC, who rejected it. This was followed in 1984 by another proposed updating, T-Force, which at first could not be pursued owing to a lack of funding. Development resumed in 1993, when it was decided to produce the series, now titled GFI, using cel animation. But Anderson was disappointed with the results and the production was abandoned. In 2005, Anderson re-affirmed his wish to remake Thunderbirds but stated that he had been unable to secure the necessary rights from Granada Ventures. His negotiations with the company and its successor, ITV plc, continued for the next few years. In 2008, he expressed his commitment to creating an "updated" version, ideally using CGI; three years later, he announced that work on the new series had commenced. Following Anderson's death in December 2012, it was confirmed that ITV Studios and Pukeko Pictures had struck a deal to remake Thunderbirds using a combination of CGI and live-action model sets. The new series, titled Thunderbirds Are Go, premiered in April 2015. In July 2015, to mark the series' 50th anniversary, Filmed in Supermarionation documentary director Stephen La Rivière launched a Kickstarter campaign to finance three new Thunderbirds episodes based on the soundtracks of three of the tie-in mini-albums of the 1960s. The project, titled "Thunderbirds 1965", was supported by ITV, Sylvia Anderson and the estate of Gerry Anderson. Thunderbirds has influenced TV programmes, films and various other media. The puppet comedy of the film Team America: World Police was directly inspired by the idiosyncrasies of Thunderbirds-era Supermarionation techniques. Allusion and homage are also evident in Wallace and Gromit: A Close Shave, Austin Powers: The Spy Who Shagged Me and Spaced, as well as the character design of Star Wars: The Clone Wars. The BBC sketch comedy Not Only... But Also included a segment titled "Superthunderstingcar" – a parody of Thunderbirds, Supercar and Stingray. IR's life-saving mission inspired the founding of the volunteer International Rescue Corps, originally made up of a group of British firemen who contributed to the humanitarian effort following the 1980 Irpinia earthquake. Virgin Group has used the series in branding its services: Virgin Atlantic operates a Boeing 747-400 airliner named Lady Penelope, while Virgin Trains owns a fleet of locomotives that are all named after main characters and vehicles and used specifically to "rescue" broken-down trains. A mimed stage show, Thunderbirds: F.A.B., has toured internationally and popularised a staccato style of movement known colloquially as the "Thunderbirds walk". 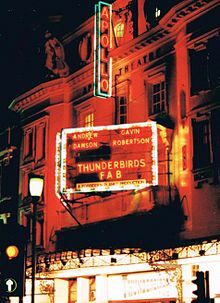 The production has periodically been revived as Thunderbirds: F.A.B. – The Next Generation. Cover versions of "The Thunderbirds March" have been released by musicians and bands such as Billy Cotton, Joe Loss, Frank Sidebottom, The Rezillos and The Shadows. Groups who have written songs inspired by the series include Fuzzbox (with "International Rescue"), TISM (with "Thunderbirds Are Coming Out"), Busted (with "Thunderbirds / 3AM") and V6 (with "Thunderbirds – Your Voice"). In 1991, Anderson filmed the music video for the Dire Straits single "Calling Elvis" with a collection of Thunderbirds-style puppets. During the 1960s, APF produced themed TV advertisements for Lyons Maid and Kellogg's. Aspects of Thunderbirds have since been used in advertising for Swinton Insurance, Nestlé Kit Kat, Specsavers and the UK Driver and Vehicle Licensing Agency. The first annual "International Thunderbirds Day" was celebrated on 30 September 2017, the 52nd anniversary of the series' UK TV debut. To mark the event, Vue Cinemas hosted special Thunderbirds screenings in 52 locations around the country. ^ Listed by age, in descending order, as stated in Bentley 2005, pp. 53–57. According to Marriott 1993, pp. 116–117, Virgil is the second-oldest son and John the third-oldest. ^ a b The names "Tracy Island" and "Hood" are not used in the TV series, appearing only in tie-in media. ^ It is stated in one episode, "The Uninvited", that Scott occasionally mans Thunderbird 5 (Bentley 2005, p. 53). ^ Zimmerman was cast after the dialogue recording for the pilot, "Trapped in the Sky", for which Alan was voiced by Ray Barrett (Bentley 2005, p. 63). ^ "Thunderbirds [TV Series] (1965)". AllMovie. San Francisco, California: All Media Network. 2015. Archived from the original on 26 July 2015. Retrieved 26 July 2015. ^ a b c Sangster, Jim; Condon, Paul (2005). Collins Telly Guide. London, UK: HarperCollins. pp. 758–760. ISBN 978-0-00-719099-7. ^ a b Bignell, p. 76. ^ a b c Mitchell, Lisa (July 1998). "Gerry Anderson Visits Australia". The Age. Melbourne, Australia: John Fairfax Holdings. ISSN 0312-6307. OCLC 224060909. ^ a b c "Thunderbirds Are Go Episode 1: Ring of Fire (Part 1)". ITV Player. London, UK: ITV plc. 4 April 2015. Archived from the original on 17 August 2015. Retrieved 17 August 2015. ^ Clark, Anthony. "Thunderbirds (1965–66)". Screenonline. London, UK: British Film Institute. Archived from the original on 30 May 2014. Retrieved 17 August 2015. ^ a b Taylor and Trim, p. 71. ^ a b Thomas, p. 24. ^ a b c d e O'Brien, p. 83. ^ a b Knowles, Elizabeth (2007) . Oxford Dictionary of Modern Quotations (3rd ed.). New York, US: Oxford University Press. ISBN 978-0-19-920895-1. ^ Bentley 2005, pp. 42 and 95. ^ Bentley 2005: vehicle descriptions, pp. 45–49. ^ Bleathman, Graham (2000). Thunderbirds FAB Cross-Sections: Exposing the Secrets of the Craft, Machinery and Headquarters of International Rescue. London, UK: Carlton Books. p. 19. ISBN 978-1-84222-091-7. ^ Bentley 2005, p. 44. ^ a b c d e f g h Bentley 2008, p. 95. ^ Bentley 2005, p. 61. ^ a b Bentley 2005, pp. 8–9. ^ Archer and Hearn, p. 103. ^ Bentley 2005, pp. 6–7. ^ Bentley 2005, p. 8. ^ a b c d e Bentley 2005, p. 12. ^ Anderson 2007, p. 21. ^ a b c d La Rivière, p. 106. ^ Anderson 2007, p. 31. ^ a b c Cull 2006 (August), p. 202. ^ a b Bentley 2005: Character biographies, pp. 52–61. ^ a b c d e f g Bentley 2005, p. 13. ^ La Rivière, p. 111. ^ a b Cull 2006 (August), p. 198. ^ a b Meyers, Simon; Middleton, Guy (producers) (2000). Thunderbirds: The Making of the Secrets (DVD). London, UK: Carlton International Media. Event occurs at 05:22–06:22. ASIN B0002475OI. ^ a b c Bignell, p. 81. ^ a b c Bentley 2005, p. 22. ^ Archer and Hearn, p. 120. ^ a b c d e f g h i Bentley 2005, p. 16. ^ La Rivière, pp. 110–111. ^ Bentley 2005, pp. 23 and 36. ^ Archer and Nicholls, p. 85. ^ a b c d e Bentley 2005, p. 24. ^ a b Bentley 2005, p. 25. ^ Cull 2006 (August), p. 196. ^ a b La Rivière, p. 122. ^ a b c La Rivière, p. 123. ^ a b c d e f Archer and Hearn, p. 121. ^ a b c d e f g h Bentley 2005, p. 26. ^ La Rivière, p. 119. ^ Archer and Nicholls, p. 87. ^ Bentley 2005, pp. 23 and 27. ^ Archer and Hearn, p. 122. ^ a b c Bentley 2005, p. 28. ^ La Rivière, p. 121. ^ Anderson 1991, p. 67. ^ Marriott 1993, p. 153. ^ a b Peel, p. 14. ^ a b c Bentley 2005, p. 31. ^ a b c La Rivière, p. 128. ^ Bentley 2005, pp. 31 and 36. ^ Marriott 1993, p. 264. ^ a b c d La Rivière, p. 141. ^ a b Marriott 1993, p. 187. ^ Archer and Hearn, p. 136. ^ Archer and Nicholls, p. 113. ^ a b Bentley 2005, p. 36. ^ a b c d e f g Bentley 2005, p. 37. ^ a b c d Archer and Hearn, p. 142. ^ La Rivière, p. 145. ^ Cull, Nicholas J. (2006). "The Man Who Made Thunderbirds: An Interview with Gerry Anderson". In Cook, John R.; Wright, Peter (eds.). British Science Fiction Television: A Hitchhiker's Guide. London, UK: I.B. Tauris. p. 126. ISBN 978-1-84511-048-2. ^ a b c Archer and Hearn, p. 125. ^ Marriott 1993, p. 202. ^ a b c d Bentley 2005, p. 20. ^ a b c d La Rivière, p. 117. ^ Bentley 2005, pp. 19–20. ^ a b c d Bentley 2005, p. 17. ^ a b c d e f g Bentley 2005, p. 18. ^ Bentley 2005, p. 33. ^ Bentley 2005, pp. 17–18. ^ La Rivière, p. 116. ^ Archer and Nicholls, p. 94. ^ a b c d Cull 2006 (August), p. 197. ^ Archer and Hearn, p. 117. ^ Anderson 2007, p. 30. ^ a b Archer and Nicholls, p. 92. ^ Marriott 1993, p. 122. ^ Archer and Nicholls, p. 91. ^ a b Bentley 2005, p. 19. ^ Bentley 2008, p. 351. ^ a b Marriott 1993, p. 162. ^ a b La Rivière, p. 114. ^ Bentley 2005, pp. 35–36. ^ a b Anderson 2007, p. 67. ^ a b c d Bentley 2005, p. 14. ^ a b c d e f Archer and Hearn, p. 111. ^ a b c La Rivière, p. 115. ^ a b c d Bentley 2005, p. 15. ^ a b Bentley 2005, p. 23. ^ Bentley 2005, p. 29. ^ a b Peel, p. 19. ^ Anderson, Anne (5 February 2013). "Thunderbirds Are Go – Again!". rhema.co.nz. Auckland, New Zealand: Rhema Broadcasting Group. Archived from the original on 19 October 2013. Retrieved 14 October 2013. ^ Anderson 2007, p. 49. ^ La Rivière, pp. 108–109. ^ Marriott 1993, p. 171. ^ Bentley 2005, pp. 10 and 16. ^ Anderson 2007, p. 43. ^ Archer and Hearn, p. 113. ^ Marriott 1993, p. 169. ^ Archer and Nicholls, p. 97. ^ a b Archer and Hearn, p. 115. ^ Anderson 2007, p. 44. ^ Archer and Nicholls, p. 99. ^ Archer and Hearn, p. 114. ^ Archer and Nicholls, p. 124. ^ Anderson 2007, p. 41. ^ Marriott 1993, p. 179. ^ Anderson 2007, p. 39. ^ Archer and Hearn, p. 104. ^ a b Bentley 2005, pp. 24 and 28. ^ Anderson 2007, p. 40. ^ Taylor and Trim, p. 15. ^ a b Farrell, Richard, ed. (Spring 2010). "Interview: Mike Trim – Designs on the Future". Andersonic. 1 (9): 4–12. ^ a b Archer and Hearn, p. 107. ^ Bentley 2005, pp. 21–22. ^ a b La Rivière, p. 113. ^ Bentley 2005, p. 21. ^ Taylor and Trim, p. 12. ^ a b c Archer and Hearn, p. 105. ^ a b Meddings, p. 46. ^ Meddings, pp. 52 and 54. ^ Bentley 2005, pp. 13–14. ^ Anderson 2007, p. 65. ^ a b Archer and Hearn, p. 106. ^ La Rivière, p. 112. ^ Anderson 2007, p. 66. ^ a b Archer and Hearn, p. 119. ^ Anderson 2007, p. 59. ^ Marriott 1993, p. 173. ^ Marriott 1993, p. 172. ^ Archer and Nicholls, p. 95. ^ Bentley 2005, p. 35. ^ a b La Rivière, p. 132. ^ Archer and Hearn, p. 143. ^ a b Bignell, p. 78. ^ Partridge, Eric (2006). Dalzell, Tony; Victor, Terry (eds.). The New Partridge Dictionary of Slang and Unconventional English: J-Z. The New Partridge Dictionary of Slang and Unconventional English. 2. Abingdon, UK; New York City, New York: Routledge. p. 1,960. ISBN 978-0-415-25938-5. ^ Sherwin, Adam (4 February 2013). "Thunderbirds Are Go (again)! ITV Commissions 26 Episodes from Lord of the Rings Special Effects Team". The Independent. London, UK: Independent Print. Archived from the original on 2 August 2014. Retrieved 21 October 2014. ^ Newman, Dean. "Top Ten TV Title Sequences". Syfy.co.uk. New York City, New York: NBCUniversal. Archived from the original on 20 February 2014. Retrieved 19 October 2014. ^ Anderson, Martin (28 September 2007). "Top 10 TV Title Sequences of All Time: the Winner". Den of Geek. London, UK: Dennis Publishing. Archived from the original on 16 June 2013. Retrieved 31 March 2014. ^ a b de Klerk, Theo (25 December 2003). "Complete Studio-Recording List of Barry Gray". tvcentury21.com. Archived from the original on 13 December 2009. Retrieved 16 November 2013. ^ a b Reavley, Morag (2003). "Thunderbirds (Original Television Soundtrack) Volume 1". BBC Online. London, UK: BBC. Archived from the original on 12 February 2011. Retrieved 5 September 2013. ^ a b Phares, Heather. "Thunderbirds (Original Television Soundtrack) Volume 1". AllMusic. San Francisco, California: All Media Network. Archived from the original on 22 November 2013. Retrieved 16 November 2013. ^ a b Huckvale, David (1994). "The Composing Machine: Wagner and Popular Culture". In Tambling, Jeremy (ed.). A Night in at the Opera: Media Representations of Opera. London, UK: John Libbey and Company. p. 119. ISBN 978-0-86196-466-6. ^ a b Donnelly, Kevin J. (2013). "Television's Musical Imagination: Space: 1999". In Donnelly, Kevin J.; Hayward, Philip (eds.). Music in Science Fiction Television: Tuned to the Future. Music and Screen Media. Abingdon, UK; New York City, New York: Routledge. p. 114. ISBN 978-0-415-64107-4. ^ a b Bentley 2008, p. 96. ^ Bentley 2005, p. 95. ^ Bentley 2008, p. 13. ^ a b c d Bentley 2008, p. 114. ^ "TV World (Midlands edition)". 2 October 1965. ^ "TV World (Midlands edition)". 18 March 1967. ^ a b c d e Bentley 2005, p. 124. ^ a b Cull 2009, p. 5. ^ Cull 2006 (August), p. 203. ^ a b c d e f g h i j Bentley 2008, p. 117. ^ a b c Bentley 2005: Foreword by Gerry Anderson, p. 5. ^ "Thunderbirds". Syfy.co.uk. New York City, New York: NBCUniversal. Archived from the original on 3 August 2014. Retrieved 21 October 2014. ^ Bentley 2005, p. 125. ^ Bessman, Jim (6 July 2002). "A&E's Captain Scarlet Re-Releases will be Red-Hot". Billboard. New York City, New York: Nielsen Business Media. 114 (27): 56. ISSN 0006-2510. OCLC 421998067. ^ Clements, Jonathan (2010). Schoolgirl Milky Crisis: Adventures in the Anime and Manga Trade. A-Net Digital LLC. p. 124. ISBN 978-0-9845937-4-3. ^ Welsh, James (11 July 2002). "Thunderbirds Join TechTV Line-Up". Digital Spy. London, UK: Hearst Magazines UK. Archived from the original on 21 October 2014. Retrieved 21 October 2014. ^ "Family Room HD is Cablevision's HD Channel of the Day, as Part of Company's Continuing '45 Days in HD, on iO TV (SM)' Countdown". PRWeb. Beltsville, Maryland: Vocus. 27 December 2007. Archived from the original on 29 December 2007. Retrieved 21 October 2014. ^ Bulbeck, Pip (16 June 2014). "ITV Studios Sells Thunderbirds Are Go! to Australia's Nine Network". The Hollywood Reporter. New York City, New York: Prometheus Global Media. ISSN 0018-3660. Archived from the original on 20 July 2014. Retrieved 21 October 2014. ^ "Thunderbirds Creator Gerry Anderson Dies". RTÉ News. Dublin, Ireland: RTÉ Commercial Enterprises. 26 December 2012. Archived from the original on 21 October 2014. Retrieved 21 October 2014. ^ Fraser, Fiona (28 May 2002). "Thunderbirds Fly into Canada". C21Media.net. London, UK: C21 Media. Archived from the original on 21 October 2014. Retrieved 21 October 2014. ^ "Thunderbirds Creator's Final Books to be Completed". BBC News Online. London, UK: BBC. 5 September 2013. Archived from the original on 5 September 2013. Retrieved 11 October 2013. ^ Lentz, Harris M. (2013). Obituaries in the Performing Arts, 2012. Lentz's Performing Arts Obituaries Series. 19. Jefferson, North Carolina: McFarland & Company. p. 9. ISBN 978-0-7864-7063-1. ^ "Sci-Fi Survey Results". radiotimes.com. London, UK. 2007. Archived from the original on 13 December 2009. Retrieved 28 November 2013. ^ Langsworthy, Billy (12 November 2013). "Channel 5 Reveals Greatest Kids' TV Shows Results". licensing.biz. New York City, New York: Intent Media. Archived from the original on 22 February 2014. Retrieved 30 March 2014. ^ a b Heffer, Simon (15 January 2011). "Why Thunderbirds is Still FAB". The Daily Telegraph. London, UK: Telegraph Media Group. Archived from the original on 19 January 2011. Retrieved 16 October 2014. ^ a b c Newman, Kim (February 2001). "Thunderbirds on DVD: Puppet Love". Sight and Sound. London, UK: British Film Institute. 11 (2 [NS]): 60. ISSN 0037-4806. OCLC 60617057. ^ a b Marriott 1992, p. 7. ^ Marriott 1993, p. 180. ^ a b Evans, Jeff (2003). The Penguin TV Companion. London, UK: Penguin Books. p. 721. ISBN 978-0-14-101221-6. ^ Viner, Brian (2 September 2000). "New Shows Are Go!". Radio Times. London, UK: BBC Magazines. 306 (3, 993): 16. ISSN 0033-8060. OCLC 1763373. ^ a b Hood, Stuart (31 December 1965). "Arts and Amusements – Television: Funderbirds". The Spectator. Press Holdings (7, 175): 14. ISSN 0038-6952. OCLC 1766325. Archived from the original on 28 January 2014. Retrieved 16 October 2014. ^ a b Thomas, p. 22. ^ Cull 2006 (August), pp. 197–198. ^ a b c d Cull 2009, p. 6. ^ Ellis, Warren (2 September 2009). "Thunderbirds will Grow a Generation of Mad Engineers". Wired UK. New York City, New York: Condé Nast. Archived from the original on 21 January 2013. Retrieved 18 October 2014. ^ Cull 2006 (August), p. 199. ^ Gilhooly, Rob (26 December 2001). "Still F.A.B. After All These Years". The Japan Times. Archived from the original on 16 May 2017. Retrieved 12 April 2017. ^ Hunt, Kate (2002). "Re-Evaluating Smoking and Gender in Thunderbirds 35 Years On" (PDF). Tobacco Control. New York City, New York: BMJ Publishing Group. 11 (2): 151–153. doi:10.1136/tc.11.2.151. ISSN 1468-3318. OCLC 645295997. PMC 1763855. Archived from the original on 18 July 2012. Retrieved 15 August 2013. ^ a b "Lady Penelope in the Dock". BBC News Online. London, UK: BBC. 28 February 2001. Archived from the original on 17 May 2011. Retrieved 7 December 2014. ^ Archer and Nicholls, p. 111. ^ a b Marriott 1993, p. 190. ^ Bentley 2005, p. 104. ^ a b Peel, p. 27. ^ Archer and Hearn, p. 135. ^ Bentley 2005, pp. 108–109. ^ Raugust, Karen (3 April 2008). "Licensing Hotline: April 2008". Publishers Weekly. New York City, New York: PWxyz. Archived from the original on 11 December 2013. ^ Bentley 2008, p. 349. ^ Bentley 2005, p. 100. ^ Bentley 2008, p. 348. ^ "Thunderbirds (1985) for Commodore 64". GameFAQs. San Francisco, California: CBS Interactive. Archived from the original on 12 November 2012. Retrieved 6 December 2014. ^ "Thunderbirds Box Shot for Game Boy Color - GameFAQs". www.gamefaqs.com. Archived from the original on 21 February 2019. Retrieved 13 July 2016. ^ "Thunderbirds: International Rescue Box Shot for Game Boy Advance - GameFAQs". www.gamefaqs.com. Archived from the original on 8 January 2017. Retrieved 13 July 2016. ^ "Thunderbirds Box Shot for PlayStation 2 - GameFAQs". www.gamefaqs.com. Archived from the original on 18 September 2016. Retrieved 13 July 2016. ^ Foster, Dave (17 September 2008). "Thunderbirds (UK BD) in September". thedigitalfix.com. Poisonous Monkey. Archived from the original on 11 December 2013. Retrieved 25 October 2014. ^ a b "Talking Shop: Gerry Anderson". BBC News Online. London, UK: BBC. 7 October 2008. Archived from the original on 12 February 2009. Retrieved 7 October 2008. ^ Archer and Nicholls, p. 112. ^ Bentley 2005, p. 41. ^ Marriott 1993, p. 159. ^ a b c d Bentley 2005, p. 117. ^ Bentley 2008, pp. 361–362. ^ a b Bentley 2008, p. 115. ^ Anderson 2007, p. 161. ^ Anderson 2007, p. 163. ^ Anderson 2007, p. 111. ^ Archer and Hearn, p. 222. ^ Anderson 2007, p. 88. ^ a b Bentley 2005, p. 118. ^ Bentley 2008, pp. 227 and 363. ^ Marriott 1993, p. 188. ^ Bentley 2005, pp. 121–122. ^ Bentley 2005, p. 122. ^ Bentley 2008, p. 116. ^ Bentley 2008, p. 336. ^ Bentley 2008, p. 325. ^ Bentley 2008, pp. 319–320. ^ Bentley 2008: Foreword by Gerry Anderson, p. 7. ^ "Anderson Mania – New Thunderbirds and Stamps". Bradford, UK: Fanderson. 11 January 2011. Archived from the original on 31 July 2012. Retrieved 11 January 2011. ^ "Thunderbirds Are Go!". itv.com (Press release). London, UK: ITV plc. 4 February 2013. Archived from the original on 4 October 2013. Retrieved 22 November 2013. ^ Plunkett, John (30 September 2013). "Thunderbirds Are Go! Blends Old and New for Return of Classic Series". The Guardian. London, UK: Guardian Media Group. Archived from the original on 12 October 2013. Retrieved 1 October 2013. ^ Anderson, Jamie (7 July 2015). "Brand-New Episodes of Classic Thunderbirds On The Way!". gerryanderson.co.uk. Anderson Entertainment. Archived from the original on 8 July 2015. Retrieved 14 July 2015. ^ a b Cull 2009, p. 7. ^ "Trey Parker and Matt Stone Talk Team America: World Police". MovieWeb. Las Vegas, Nevada: WATCHR Media. 4 October 2004. Archived from the original on 6 July 2008. Retrieved 19 January 2008. ^ Weprin, Alex (3 April 2008). "George Lucas Talks Clone Wars". broadcastingcable.com. New York City, New York: NewBay Media. Archived from the original on 27 November 2012. Retrieved 17 August 2010. ^ Anderson 2007, p. 97. ^ a b Bentley 2005, p. 119. ^ Marriott 1993, p. 181. ^ Bentley 2005, p. 121. ^ Bentley 2008, pp. 346–347. ^ Bentley 2008, p. 360. ^ Farrell, Richard, ed. (Spring 2012). "Interview: Jan King – Should Have Gone to Specsavers". Andersonic. 1 (13): 34–36. ^ Howard, Kirsten (16 August 2017). "First Annual International Thunderbirds Day Announced". Den of Geek. London, UK: Dennis Publishing. Archived from the original on 28 June 2018. Retrieved 21 February 2019. Originally published as: Anderson, Sylvia (1991). Yes, M'Lady. London, UK: Smith Gryphon. ISBN 978-1-85685-011-7. Bignell, Jonathan (2011). "'Anything Can Happen in the Next Half-Hour': Gerry Anderson's Transnational Science Fiction". In Hochscherf, Tobias; Leggott, James (eds.). British Science Fiction Film and Television: Critical Essays. Critical Explorations in Science Fiction and Fantasy. 29. Jefferson, North Carolina: McFarland & Company. pp. 73–85. ISBN 978-0-7864-8483-6. Cull, Nicholas J. (August 2006). "Was Captain Black Really Red? The TV Science Fiction of Gerry Anderson in its Cold War Context". Media History. Routledge. 12 (2): 193–207. doi:10.1080/13688800600808005. ISSN 1368-8804. OCLC 364457089. Cull, Nicholas J. (2009). "Gerry Anderson (1929–)". Fifty Key Figures in Science Fiction. Routledge Key Guides. Bould, Mark; Butler, Andrew M.; Roberts, Adam; Vint, Sherryl. Oxford, UK; New York City, New York: Routledge. pp. 3–7. ISBN 978-0-203-87470-7. Garland, David (2009). "Pulling the Strings: Gerry Anderson's Walk from 'Supermarionation' to 'Hypermarionation'". In Geraghty, Lincoln (ed.). Channeling the Future: Essays on Science Fiction and Fantasy Television. Lanham, Maryland: Scarecrow Press. pp. 61–75. ISBN 978-0-8108-6922-6. Thunderbirds volume originally published separately as: Marriott, John (1992). Thunderbirds Are Go!. London, UK: Boxtree. ISBN 978-1-85283-164-6. Taylor, Anthony; Trim, Mike (2006). The Future Was FAB: The Art of Mike Trim. Neshannock, Pennsylvania: Hermes Press. ISBN 978-1-932563-82-5. Thomas, Andrew (November 1994). "Thirty Something!". Dreamwatch. Brighton, UK: Dreamwatch Publishing (2): 22–24. ISSN 1356-482X. OCLC 225907941.